A neat and compact invitation style perfect for casual parties and weddings, seal and send invitations consist of three panels and a flap that folds over into one 4 1/8 x 5 3/4 invitation that is ready to hit the mail - no envelope necessary! Print your party information on the first two panels and use the final perforated panel as an RSVP card. Seal and sends are pre-cut to size and pre-scored for easy, accurate folding. Choose from a variety of smooth, matte finish colorful card stocks to complement your event. For your convenience, a free downloadable Microsoft Word print template and instructions are available right below the product image. Our in house print tests have revealed that seal and sends are laser and ink jet friendly, though as they are of varying weights and brands and all printers are different, we urge you to order a sample to test print prior to purchase. 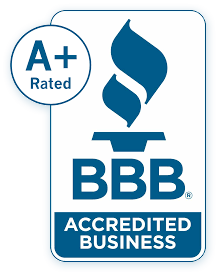 For best mailing results, we recommend sealing the sides, as well as the flaps of seal and sends before mailing. Is the bottom portion (the perforated response card) of the seal-and-send invitation pre-printed? Or does the invitation come completely blank? What are the dimensions of Seal and Send Invitations? As detailed in the product description, each folded seal and send measures 4 1/8 inches x 5 3/4 inches; with unfolded measurements of 14 1/2 inches x 5 3/4 inches. Do I need RSVP envelopes with my Seal & Send invitations? The perforated response card that is part of your Seal and Send invitations should be sent as a post card. This efficient and eco-friendly option for wedding invitations eliminates the need for RSVP envelopes. What size envelope fits a send and seal invitation? An A6 envelope is the "best" fit, but as they are not designed to go into envelopes, this is not a great fit. There is a lot of wiggle room. Customers have commented about A2 envelopes, unfortunately this size will not work at all. 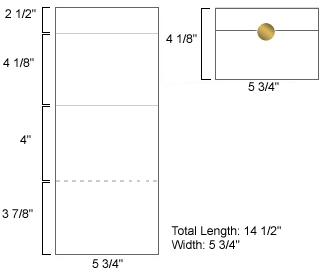 An A2 ( 4 3/8 x 5 3/4) Envelope has a width of 5 3/4 which happens to be the same width as the seal and send. Cards must be slightly smaller than the envelopes to fit. Will The Perforated RSVP Card Tear In The Mail? Since Seal n Sends do not use an outer mailing envelope I am concerned that the perforated response card may become detached during the mailing process. Have you heard about this issue? I would appreciate any advice you may have? Great question! The design beauty of the seal and send is that no envelopes are required to mail the invitations and the RSVP is perforated to be sent back as a post card. Both these cost measures are effective in staying with and keeping to a wedding budget. However, most invitations mailed will travel through the automated postal meters and without an outer envelope to prevent damage it is possible that the perforated card may become loose. We have not had any instances of the RSVP card tearing, but it is a real possibility. To prevent this make certain to correctly fold the invitation so the RSVP is on the inside. Secondly, and more importantly, use semi or permanent wafer seals on the sides of the invitation. This will prevent bowing and keep the invitation flat as it is mailed through the post office. Do You Ship The Seal & Sends Open or Folded? Orders For Seal n Send Invitations are delivered open for easy printing (sample requests are usually sent folded). Need a simple solution for your wedding invitations? Look no further. Our Seal & Send invitations are a convenient and eco-friendly way to save some money for your honeymoon. 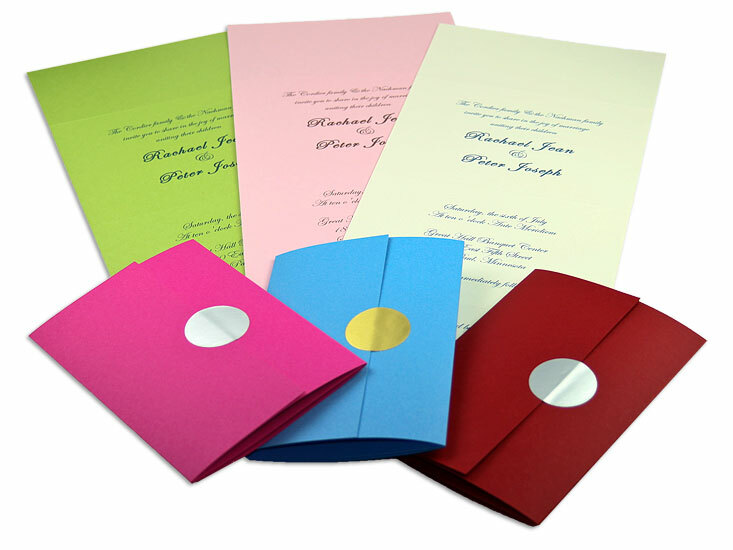 Our Seal & Send Invitations come in 8 colors. They come pre scored for easy folding and include a detachable perforated response card. No Fuss Printing Saves the Day! 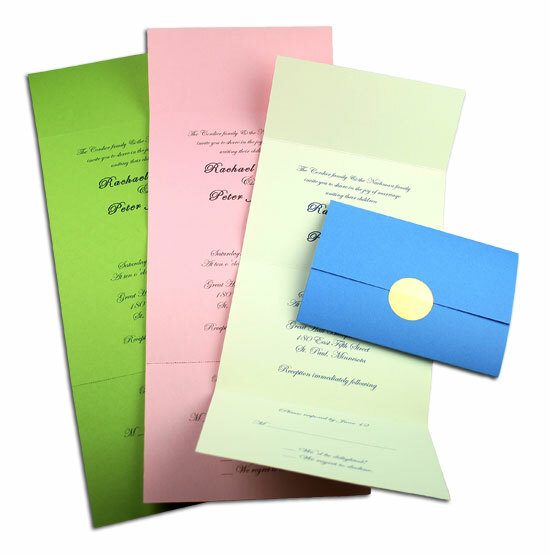 Seal & Send Invitations come pre-cut to 14½ inches x 5¾ inches flat and can be printed from most inkjet and laser printers. Simply download the Seal & Send template, enter your event info and click print! Make sure you do a test print first! Your Seal & Send invitations don't need an envelope and use the same postage as a standard first class letter. Consider sealing the sides of your invitations, and ask your local postal carrier to hand cancel your invitations. Our peel and stick seals are both a simple embellishment as well as an elegant way to seal your invitations.